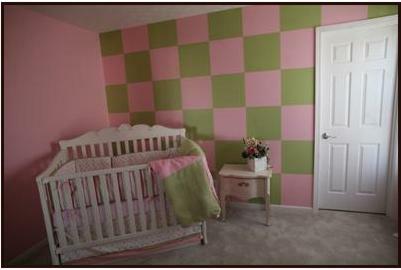 Nursery designs with stripes and checks are very popular and much easier to create than you would think. On this page you'll find loads of pictures of striped nurseries to give you some ideas. The baby nurseries below are all different - each special in their own way. Take a look and see if you find one that gets your creative juices flowing! 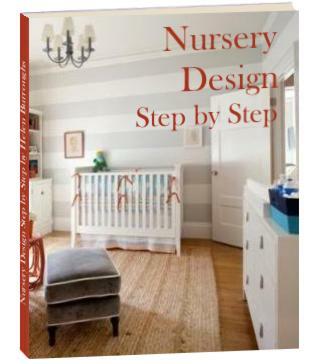 Pick and choose ideas from the different nursery designs and put them together to create your own unique nursery using checks and stripes. Don't forget to come back and enter our baby nursery photos contest when you're finished! This nursery design was sent to us by Jake Nickell. You can read more about this checks and stripes modern nursery idea here. This nursery idea was sent to us by Roger and Abby. You can read more about this painting checks nursery idea here. 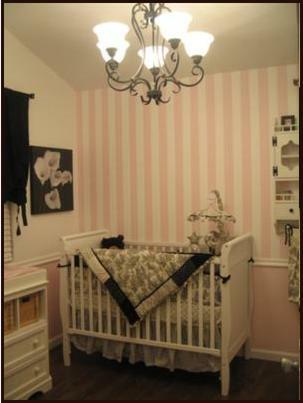 This baby nursery was sent to us by Brandy Myers (Millville, DE). You can read more about this striped secret garden nursery idea here. 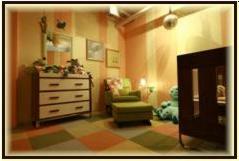 This baby room was sent to us by Maria Q. Stultz. You can read more about this song bird nursery idea here. This nursery room was sent to us by Heidi (Wilton, Iowa). 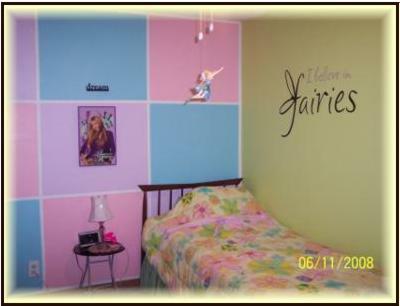 You can read more about this Tinkerbell nursery idea here. 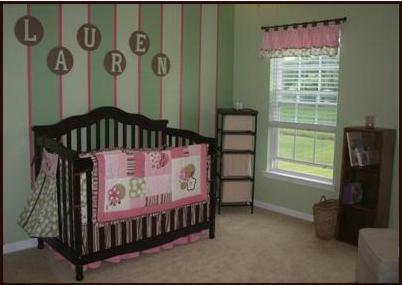 This nursery design was sent to us by Gretchen Archibald (Gainesville, VA). You can read more about this Brown Stripes nursery here. 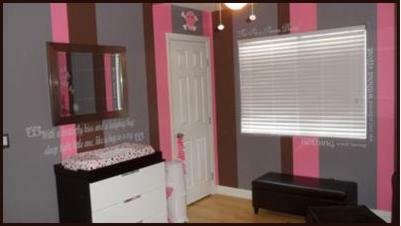 This baby room design was sent to us by Katrina Howard (Gaston, OR, USA). You can read more about this Cotton Candy Dream nursery here. 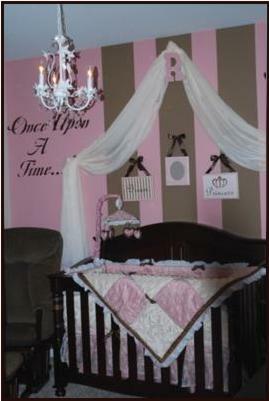 This nursery idea was sent to us by Susan (Kaysville, UT, USA). You can read more about this Fun with Stripes nursery here. This nursery room idea was sent to us by Susan Leah Johnson (Indianapolis, IN). You can read more about this Neopolitan Stripes nursery here. This baby nursery design was sent to us by Laura and Jimmy Knabe (Cincinnati, Ohio). You can read more about this Polka Dots, Stripes and Checks nursery design here. 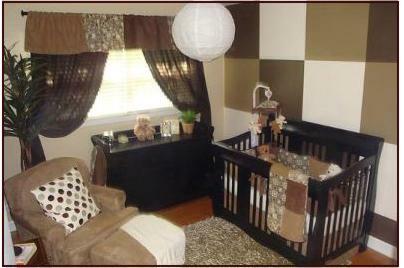 This nursery decorating idea was sent to us by Mesa, (AZ, USA). You can read more about Brooklyn's pink and white bungalow nursery here. This nursery design idea was sent to us by Rachel Koehl (Metairie, Louisiana). You can read more about this think pink nursery here. 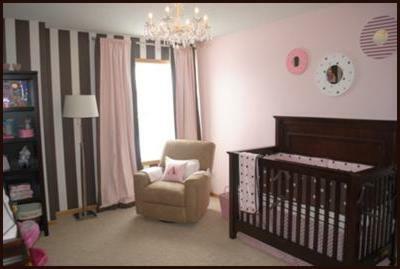 This baby nursery was sent to us by Sheila Markell (Maple Grove, MN). You can read more about this pink and brown nursery here. 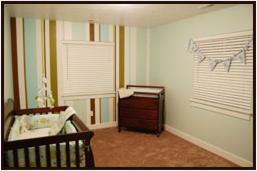 This nursery room was sent to us by Nicole Richards (Sparks, NV). You can read more about this once upon a time nursery here. 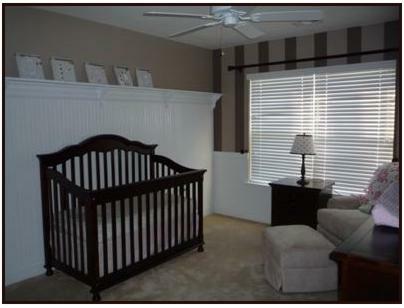 This baby room design was sent to us by Amy (Fountain Inn, SC). You can read more about this pink and brown baby nursery here. 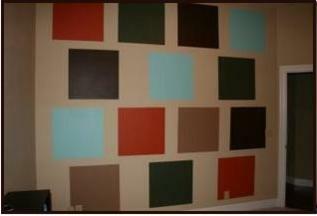 This nursery idea was sent to us by Eric and Jen Eierdam (Las Vegas). 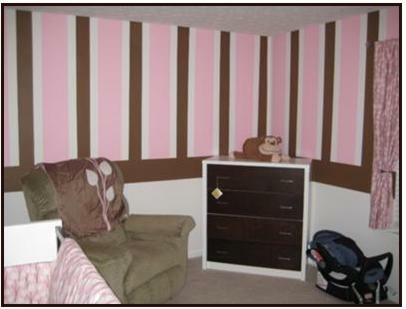 You can read more about this pink and chocolate stripes nursery here. 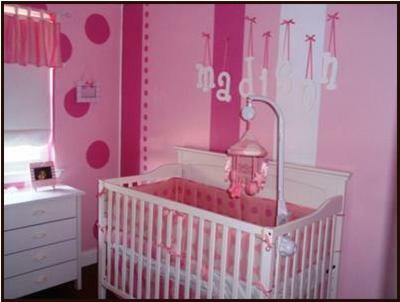 This baby nursery was sent to us by Kacey Pierson (Texas). You can read more about Roman's Angel watching over him nursery here. 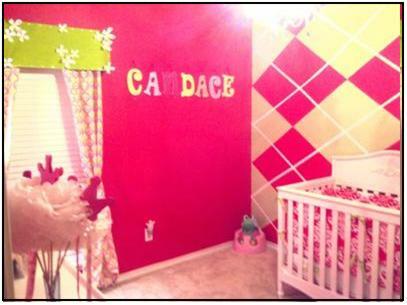 This baby nursery room decorating idea was sent to us by Rachael Claybourn (Weatherford, TX). You can read more about this sweet and chic baby nursery here. 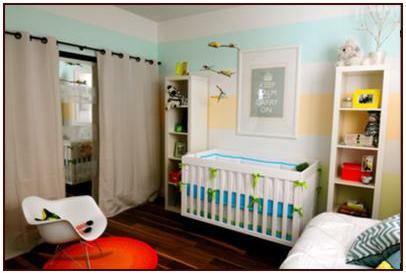 This nursery design idea was sent to us by Lindsey Stone (Sonoma, CA, USA). You can read more about this citrus stripes baby nursery here. 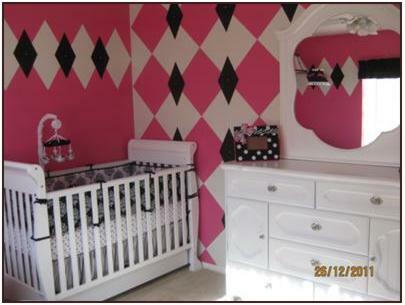 This checked baby nursery was sent to us by Trina Torres (Waukegan, IL USA). You can read more about this modern geometric shape nursery here. 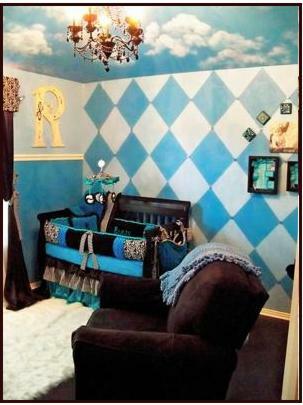 This striking baby nursery with a diamond design was sent to us by Ashley Balestreri (Henderson, NV. USA). You can read more about this pink and white diamonds baby nursery here. 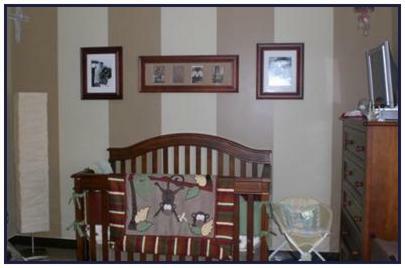 This striped baby nursery in caramel shades was sent to us by Marilyn Simpson (Okinawa, Japan). You can read more about this Monkey Chic nursery here. 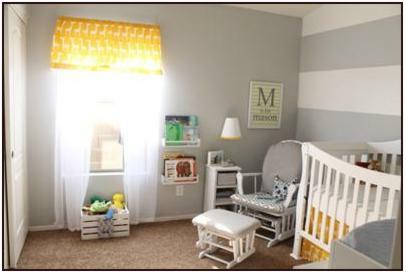 This modern striped nursery room in yellow and grey was sent to us by Christi (Surprise, AZ, USA). You can read more about this Owl and Giraffes nursery here. 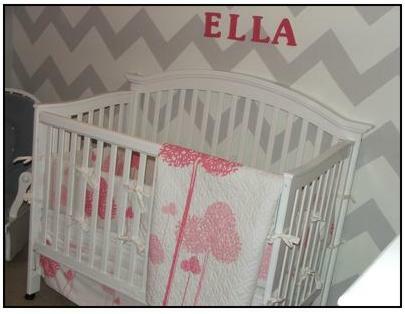 This pink and grey nursery with grey chevron stripes was sent to us by Jayna Klinkebiel (Jefferson, OR, USA). You can read more about this Modern Zigzag baby nursery room here. 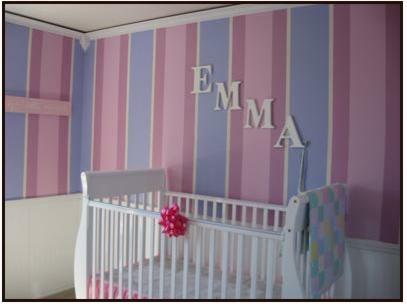 I hope these baby nursery rooms with checks and stripes have inspired you to create your own stripy nursery design! Join in and show off your own baby rooms! It's easy to do. How? Simply click here to enter our baby nursery photos contest.